Blue gemstones have a cool elegance that adds a fabulous vibe to any outfit. From blue diamonds to aquamarine and blue topaz, there are many options to choose from when you buy precious & semi precious stones jewelry. Want to know which are the most popular blue gemstones? Keep reading to find out. We have prepared a list with the best blue gemstones that will inspire you and help you choose the right jewelry for your style. Whether dark blue with navy hues or light blue that resembles that color of the sky, blue gemstones look and feel amazing. They can also be versatile and great to wear with both formal and casual outfits. So, without further ado, here is our list of the best blue gemstones you should definitely have in your jewelry box. This gorgeous precious stone couldn’t miss from our list. It is the most popular of the blue gemstones and, lately, has become an alternative to diamonds for engagement rings. 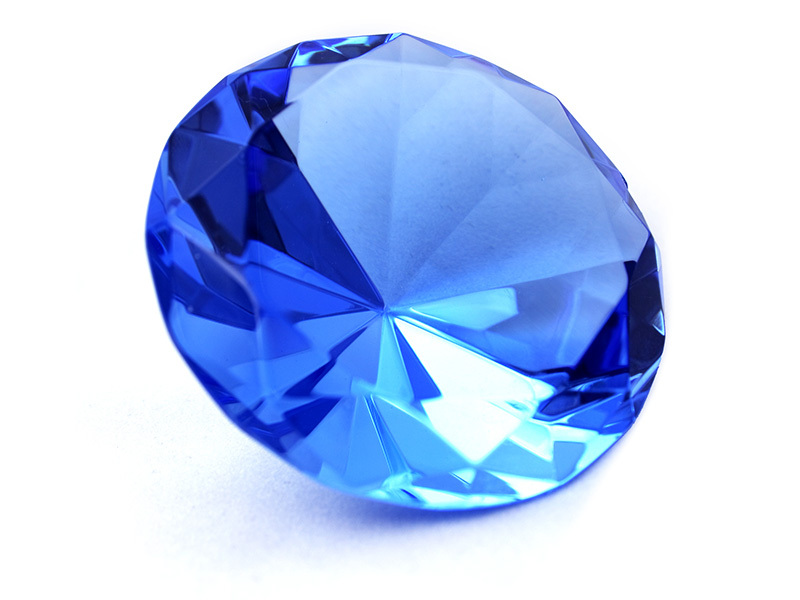 Another great thing about the blue sapphire is that it has a hardness of 9 on the Mohs hardness scale. This means that this gorgeous stone is highly durable and resistant to scratches. Whether you get a sapphire ring or a big sapphire necklace, you will look fabulous this season as you flaunt your precious jewelry. The second most popular of the blue gemstones, this variety of topaz has a lighter hue. What is interesting to know about blue topaz jewelry is that this gemstone is very rare. Natural blue topaz can be a bit pricey due to the stone’s scarcity. However, you can find topaz that has received a color treatment. Most topaz is colorless and jewelry makers treat it so that it gets a beautiful blue color. If you want to buy blue gemstones that are affordable and high-quality, then the blue topaz is definitely a great option. Not to confuse it with cubic zirconia, which is a synthetic gemstone, blue zircon is a natural semi precious stone. It is one of the most brilliant blue gemstones and sparkles beautifully resembling a diamond. However, blue zircon has a hardness of 6 to 7.5 on the Mohs hardness scale, which means that you have to take extra care of it. Another interesting thing about one of the most brilliant of the blue gemstones is that zircon is the birthstone for December. You thought garnet were only red, didn’t you? Here’s an interesting fact. Until 1998 you could find garnets in every color of the rainbow except blue. 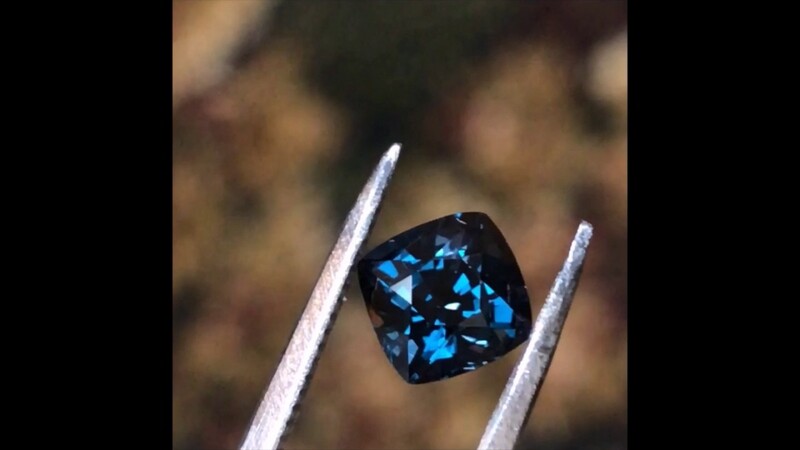 That’s right, blue garnet is so rare that it wasn’t even discovered until 1998. Even now, its rarity makes it far more expensive than a diamond. However, a blue garnet is one of the most spectacular blue gemstones. It can be quite difficult to find it, though, as it is a collector’s item and rarely featured in mainstream jewelry designs. Of course, when talking about blue gemstones, the turquoise couldn’t miss from this list. This semi precious stone is a unique one because of its dark inclusions resembling veins. A turquoise’s pattern of inclusions is called a matrix. However, you should know that this beautiful stone has a low hardness score (5 up to 6) on the Mohs hardness scale. Wear it carefully and be very gentle when cleaning it. 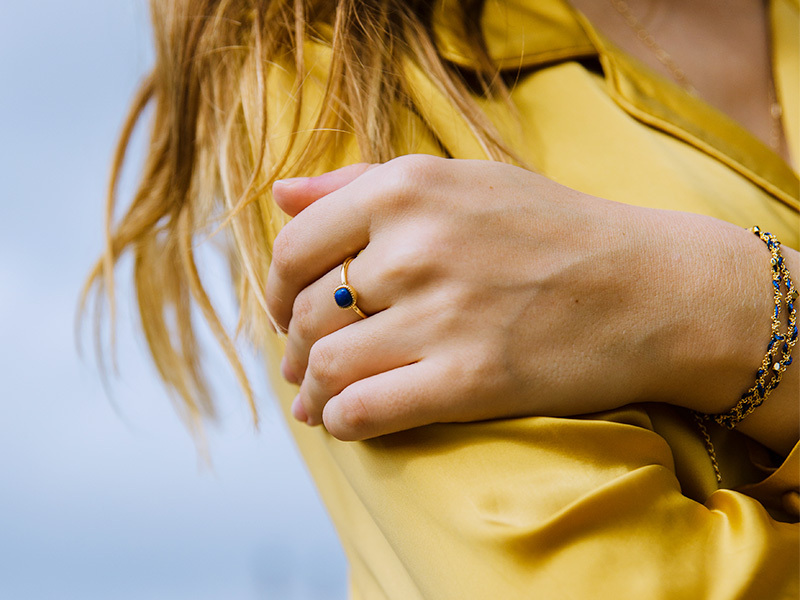 A unique and mysterious gemstone, lapis lazuli is one of the most interesting blue gemstones. It has a rich history since Ancient Egyptians were obsessed with it. It also has a distinctive look with its dark blue color and gold or white specks. When you take a closer look at a lapis lazuli gemstone, you will notice that it resembles a starry sky at night. 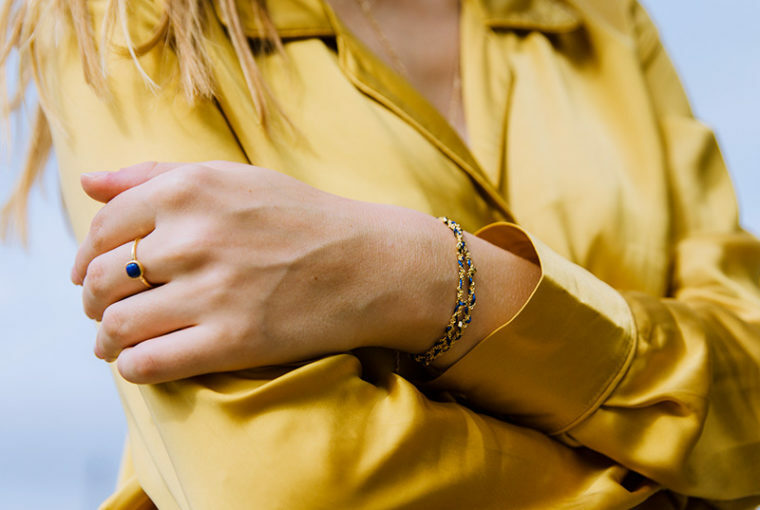 This is why a lapis lazuli ring or a pair of earrings will add a subtle mysterious vibe to your look. 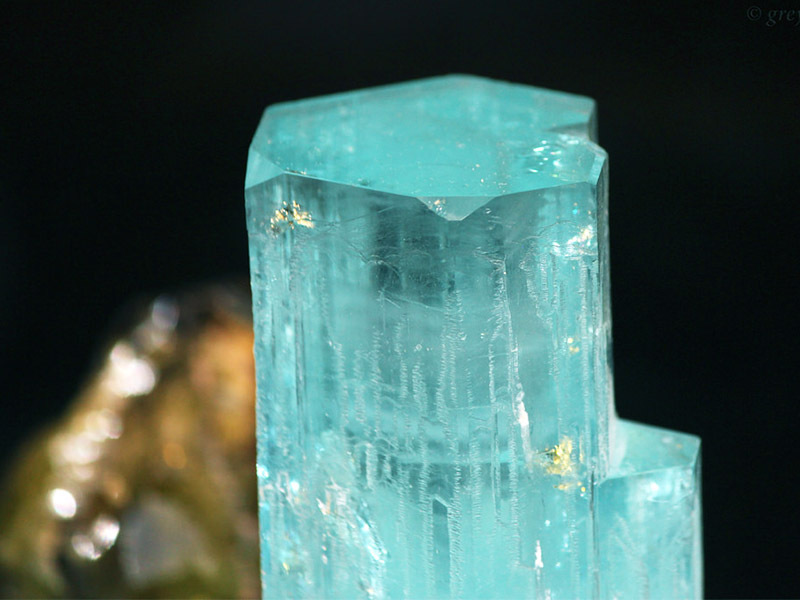 The birthstone of March, aquamarine is one of the most coveted blue gemstones. It has a distinctive light blue look, great clarity and it is part of the same family as emeralds. Vivid deep blue aquamarine stones are the most valuable and they look simply spectacular. This amazing gemstone also has a good hardness score (7.5 to 8 on the Mohs hardness scale), which makes it an ideal choice for your everyday jewelry. However, you should be aware that most aquamarine gemstones on the market receive a color treatment to enhance their lovely blue color. There are many colored diamonds in the world, but the blue variety is one of the rarest. The blue diamond is also one of the most beloved blue gemstones and not only for its splendid color. Blue diamonds have a perfect hardness score of 10 and come in an array of different shades. However, if you want to buy blue diamond jewelry, expect to pay more for it than you would for clear diamonds. After all, this is a rare variety of the diamond we all love so much. If you want to find out more about jewelry, read our other articles as well. We publish daily articles on this blog and you can find a lot of great information here. To view Ana Luisa’s unique gemstone jewelry collections, visit our online jewelry shop. We feature beautiful designer pieces at fair prices. What Spring Jewelry Should You Get This Season? Where to Buy Compass Necklace?